I wouldnt know why. They didnt swap to Honda because they know Honda will make a better PU. They changed because their working relationship with Renault wasnt working out and working together with Honda gives them the chance at a better partnership with a better PU integration in what is an ‘engine’ formula. They had a year to test waters with their sister team Torro Rosso and the data is promising. We’ve all seen how ‘bad’ Renault have been this year. If you ask me, i’d think chances are good that Honda will be at least on par with Renault next year. The only concern i’d have at this point is if Honda can build a competitive engine not only on the power front, but reliability wise too. Personally, i think McLaren will be hitting themselves at seeing RedBull reap the rewards they helped to build up. I think new aero regulations will benefit more Mercedes than Ferrari so I expect Mercedes to be stronger. I hope I am wrong though. McLaren will improve significantly with all they have learned this year and two Young and fast drivers ready to push in the same direction. Why do you think that? Just curious, if you have any technical thoughts on why. No specific technical aspects but I have the idea(maybe I am wrong) that this Ferrari and (obviously) RB feel more confortable with the complex aero we have had the last two years. Taking into account that, among other things, the front wing will be more simple in 2019 I think that Mercedes could feel more confortable as they were between 2014 and 2016. Ups!, totally right mate. I think they will be strong, maybe the 5th-6th team. I hope to see Kimi doing some good races. Someone once said that the Honda PU was a piece of Jewellery. The size zero version WAS beautifully made, don't you agree? Just compare to the bulky unit from Renault for instance. McLaren obviously hindered Honda a lot with the size zero requirement which ultimately wasted the 2015 and 2016 seasons (due to the token system), plus an annual $100m is far better spent on the power unit than thanklessly donated to the McLaren chassis, so it is for the best they are apart. Being with Red Bull who have arguably the finest chassis in F1, gives Honda the best chance to take podium results -- even if their PU is still quite inferior to Mercedes and Ferrari. Sorry guys, but I think you underestimate Renault too much. It's about time that French team joins the front. They invested to much to be just 4th. I believe that Renault will be max 0.5 sec behind. And their driving pairing is probably the best in F1. It's possible! I will believe it when I see it. It would be great if Renault could join the top teams and regularly finish races in the top 5 (driver) positions. The Merc was, and still is, more size zero than all the Honda PU: overally shorter/smaller/less wide/with a smaller foot print and 'lower' , atleast as "beautifully made" and clean as the Honda... and obviously way stronger. The real "size zero" was and still is the Merc. Not very impressed with Honda's progress this year. Thir progress appears logical and normal to me; nothing groundbraking. And to say they're better than Renault now is a joke... Maybe their PU has produced more peak power than the Renault in two or three qualy sessions, but what about reliability, fuel consumption, race power etc? how many Honda engines did and are capable of doing 7 gps? how many gps did their spec 3 run without breaking? Will Honda keep that peak power or increase it and sort out the reliabilty and the efficiency at the same time? I'm not writing off honda, they can succeed, catch Renault (without having to bring a new pu every 3 gp) and really catch the others, but in 2018 did none of that, contrary to what many medias say. Hoping that we wont see whole field being lapped by TOP 3 teams, and whole team giving at least small resistance in fights on track compared to previous years. Hoping to see new winner except Red Bull, Ferrari and Mercedes since Melbourne 2013. I am hoping the aero changes allow for cars to follow each other - all PU craziness aside! Compressor as well as turbine of 2015 unit was centrifugal, not axial. Smaller turbo was not forced upon by McLaren, it's works partnership so overall packaging is collaboration but Honda lacked comprehensive understanding of the PU esp ERS-H and ICE at first hence wrong route. That's what very Honda project leaders and engineers said, plus even after the split with McLaren, Honda side dont say anything about it. Development is done by making demand/request each other to seek the best possible compromising point so of course there were areas where McLaren asked Honda and vice versa, you can notice every bit of traces of Brackley demanding Brixworth and vice versa as well (ditto for Ferrari and Renault), but saying size zero hindered Honda is as pointless as saying Honda forcing shorter and bigger inlet pipe (i mean just for example) hindered car design. btw so many people are obsessed way too much with the term size zero, it's just Ronspeak and making things as small/light as possible while maintaining/increasing performance is the most basic principle of engineering, V10 of mid 1990s weighed like 130kg but Yamaha's engine was below 100kg and it was said that they were ridiculous or too ambitious, but within less than 10 years V10/8 weighing comfortably less than 100kg became norm, so V10/8 of 2000's was "size zero V10/8", current gearboxes are "size zero gearbox" compared to gearboxes of 1990s,portable CD player was "size zero CD player", SD cards are "size zero memory media", and so on and on. Forget about size zero already, that's the main reason that's distorting perception of everything. Also there is no evidence for this 100m cash giveaway stuff, it looks like Honda were paying for drivers salary, plus quite a bit as some sort of consultant fee (Honda relied on McLaren for various things from manufacturing PU parts like inlet plenum and intake, ES development, arrangement of components in Europe (battery and all those miscellaneous parts) to whatever industry info and methodology), but 100m cash unattached? quite doubtful. Seems you are not really aware of actual contents of issues encountered and strategy they are taking but only seeing superficial things. Spec 1 ICE did 5 races, MGU-K, ES and CE did 6 races. New TC and MGU-H introduce at 2nd race for both cars after suffering from issue in 1st race, meanwhile Hartley's first ICE plus all the other components were wiped out at 5th race by crash. Spec 2 suffered some initial hiccups but they made 5 races. Both specs didnt go through 7 GPs but new specs have arrived before 7th race and in terms of development it is disadvantageous to postpone the introduction, there is no reason to prioritize reliability evaluation over pushing performance, so. Plus once exceeding 3rd components, it's just better to introduce whole new set of PU rather than just exchange 1 or 2 components, because 1.more specimen that has been actually used on track the better for accelerating development, 2.by swapping everything you can make calibration on dyno before coming to races so you can concentrate on more important stuffs at circuit, 3.you can have more stocks in pool. Regarding spec 3 it seems they were not supposed to introduce it this year initially but changed strategy to go aggressive and trial and evaluate it on real environment right away by using the rest of the season more as a test session (but doesnt mean they threw away race result). I'm curious what media you are reading, because as far as I know even all those tabloids like autosport etc do not write/say such things as "they can succeed, catch others" next year let alone 2018. I don't think Newey will get anything wrong, but I expect he will try and over shrink wrap the car as he has since his McLaren days. This will most likely lead to cooling and thus reliability issues for the Honda PU. 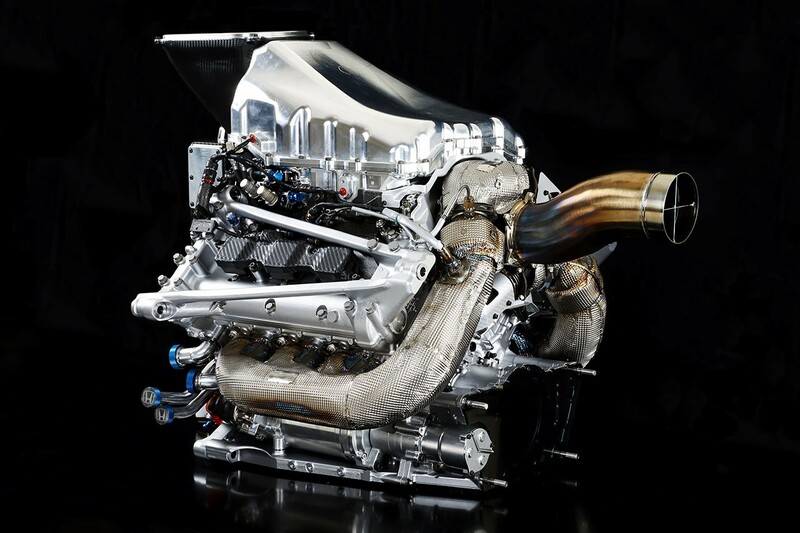 The difference being this time, Honda will work with them to overcome cooling issues through all means, rather than tell them, this is the engine you get, do what you like.